Looking for a cherished memento of your special occasion that your guests will use over and over again? Well, here’s a handy favor that’s also a heartfelt expression of love! 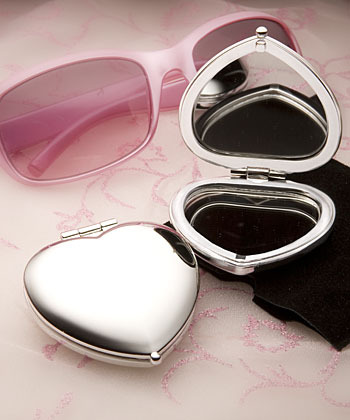 A Fashioncraft exclusive, each 2 ¼” x 2 ¼” shiny silver plated compact mirror features a sturdy hinged construction and a captivating heart shape that opens to reveal the mirrors within. Great as favors for showers, anniversary parties or any love filled event, each compact comes slipped into a protective black felt pouch and packaged inside a white gift box.